New Visions Charter HS for Advance Math & Science III is located at the Sheepshead Bay HS campus in Brooklyn. It has been some time since I found myself going down a high school corridor. Therefore, I had no idea what to expect as I drove to the New Visions Charter High School for the Advance Math & Science III (AMS III) last Friday. 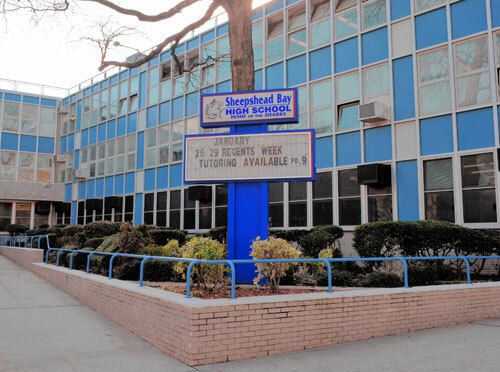 AMS III is housed at the Sheepshead Bay High School campus in Brooklyn, NY. After checking in, I felt a sense of nostalgia as I observe the next generation of leaders scurrying through the halls. Their warmth and welcoming spirit put me at ease and I forgot all jitters of going back to high school. I was ready to be a part of Anchor week. Anchor week is a project that challenges students within the New Vision Charter High School network to design a better campus. After researching and developing their ideas, students delivered their presentations to classmates, administrators, parents, community members, and a panel of judges from various professions outside of the institution. Ashalla was invited to participate as one of the Anchor judges. It was a proud moment to watch groups of students proposing unique ideas such as rooftop gardens and energy conservations projects to improve their campus. Many of the students even went further to consider how their proposed ideas would impact the school’s surrounding communities. New Visions is definitely taking the right steps in shaping these future leaders. It was an exciting experience to go back to high school, even if just for a day. New Visions Charter High School is a part of New Visions for Public Schools; an organization committed to designing, creating and sustaining great schools for New York City’s highest need students.